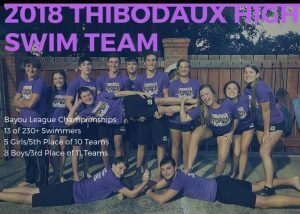 With only 13 Swimmers, the Thibodaux High School Swim Team proved that they could hold their own at the Bayou League District Championships Monday night. The Girls’ Team composed of Maddie Bowers, Meagan Matherne, Alexis Waddle, Emily Naquin, and Demi Bourg Placed 5th out of 10 teams. While the Boys’ Team with only 8 swimmers, Grant Pennison, Christian Ricouard, Daelan Bourg, Philip Landry, Caden Poynter, Dylan Stentz, Luke Pennison, and Daniel Bigger, placed 3rd out of 11 teams.